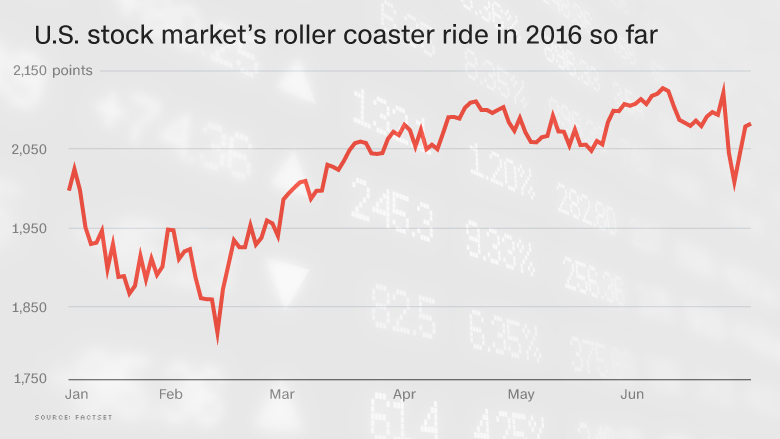 Is the Brexit market panic already over? Nope! Is Brexit market panic already over? Nope! It's the last day of the first half of the year. And it's been a wacky one on Wall Street -- especially the past week! So what now? U.S. stocks have recovered a big chunk of their post-Brexit losses from Friday and Monday. And the FTSE 100 in the U.K. is higher than where it closed on Thursday. What Brexit, right? The Dow and S&P 500 are still up nearly 2% this year. CNNMoney's Fear and Greed Index, a measure of market sentiment, has even moved back to Greed mode lately. It hit levels of Fear on Friday after the Brexit vote. Major government bond yields are still lower than a week ago. Gold is higher. The FTSE 250, the market index that focuses more on the domestic British economy, is down more than 7% from pre-Brexit levels. The pound is still off sharply from a week ago too. And the Nasdaq -- home to popular, widely held tech stocks like the FANG foursome of Facebook (FB), Amazon (AMZN), Netflix (NFLX) and Google-owner Alphabet (GOOGL) as well as Apple (AAPL), the world's most valuable company -- is still down 4% this year. I hate to accentuate the negative. But many experts think the Brexit glass (of warm Guinness?) is more half-empty than half-full. Thomas Wilson, senior investment manager at Brinker Capital, said investors may be getting their hopes up for a scenario where the U.K. and EU come to some sort of compromise that would allow for a "watered-down Brexit." But he believes that scenario ultimately won't come to pass. Henry McVey, head of global macro and asset allocation for KKR, wrote in a report Thursday that this is an "Adult Swim Only" market, and that investors need to continue to tread cautiously. "Markets have cut a wide swath so far this year, enticing investors to buy and/or sell often at what was -- in hindsight -- likely the time to do the exact opposite of what one's emotional core was suggesting," he wrote. Scott Wren, senior global equity strategist for the Wells Fargo Investment Institute, added that the market is suffering from a bout of "hysteria" -- fitting since it's the title of a song by British prog rockers Muse as well as British 80s rock band Def Leppard. Wren said in a report that U.S. blue chip stocks may be dependable investments that benefit from people seeking safe havens. But it's going to be a bumpy ride in the markets for awhile. So buckle up. "Market volatility is likely to continue, to the upside and downside, in coming weeks as investors seek more clarity on the UK referendum result that will likely take years to play out completely," Wren wrote. Another possible warning sign? High yield bonds -- aka junk bonds -- are still holding their own. The iShares iBoxx $ High Yield Corporate Bond ETF (HYG) and SPDR Barclays High Yield Bond ETF (JNK) are still both up more than 4% this year. Gershon Distenfeld, director of high yield and investment-grade Credit at AB, notes that junk bonds and stocks usually move in tandem. And both markets may be ignoring big global issues. "The slowdown of China. Political concerns around the world. Default risk. These are all still real issues," Distenfeld said. Still, some market strategists think that bullish investors are right to buy stocks following the Brexit. Why? The Federal Reserve, which up until recently had been expected to raise rates this summer, may now be on hold for the foreseeable future. 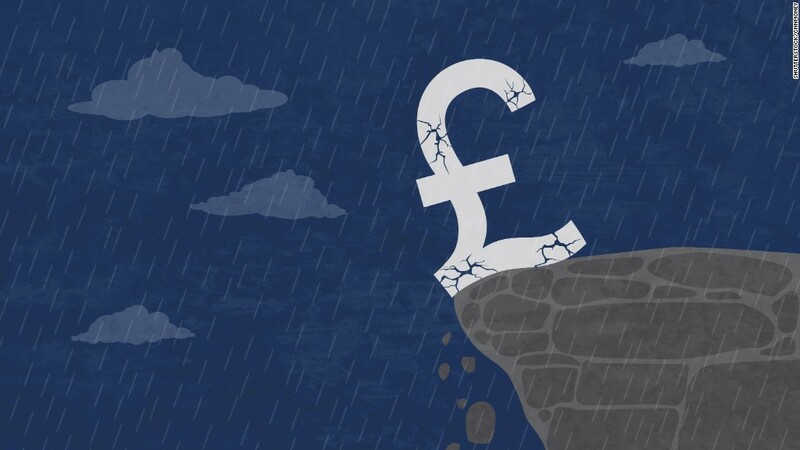 "The Brexit vote and economic uncertainty that it creates takes the Fed off the table," wrote Tony Dwyer, a market strategist with Canaccord Genuity in a report. "We believe the Fed is unlikely to raise rates until December 2016, or at the very least until we get some clarity on the UK withdrawal." For that reason, some defensive stocks -- ones that pay high dividends in particular -- could benefit in the post-Brexit world. Think of companies in food and beverages, tobacco, utilities and telecom, for example. Their dividend yields are higher than most government bonds. "Consumer staples have been oversold on Brexit," said Chuck Self, chief investment strategist of iSectors, an ETF strategy firm. "People are going to drink. People are going to smoke. The big dividend payers are going to be fine." But investors need to be extremely careful right now. There is still so much that we don't know about how the Brexit is going to play out. It's scary that momentum loving equity and stodgy fixed income investors are both bullish. "The bond market may be wrong or it may be the stock market," said Larry Hatheway, chief economist with GAM in London. "But something's got to give."